Civilization games always have been quite popular. 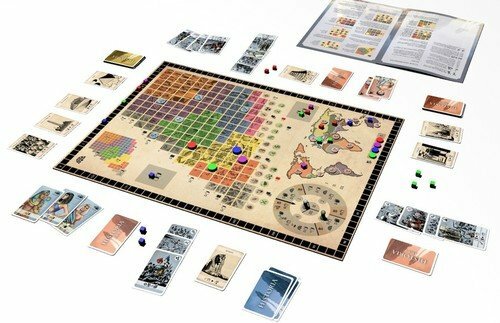 Since the triumph of the famous computer game back in the 90s of the last century, there were a lot of boardgames that adopted the theme - sometimes more, sometimes less successfully. Last year's Nations was definitely one of the best games of its kind, but the market always moves on and so it is no wonder that we are confronted with a lot of new civilization games again in 2014. According to my taste Historia by Marco Pranzo, author of Upon a Salty Ocean, is one of the most promising ones. Typical for GIOCHIX.IT, we are confronted with a relatively abstract game. The major part of the board is covered by a development matrix on which we can move our development markers upwards by developing our military strength and to the right by improving our level of technology. As the development matrix expands from a single space on the left bottom diagonally upwards and to the right, you are forced to develop both attributes. Otherwise you will sooner or later reach the edge of the matrix, a situation which may hamper further development. Still, with progressing time the development matrix expands and so you can choose as a strategy to concentrate either on the military or the technology path. Next to the lines and columns of the matrix we can see the civilization goals (military and technical) we already have reached with our development markers. With these civilization goals we can expand our possibilities by being able to use the advanced actions instead of the standard ones. On the other hand, a lot of civilization goals also have a direct effect, and so they can give players cards back into their hands, enable them to draw new advisor cards or to play more than one card in a turn. Finally, a lot of leader cards that are given to the players at the beginning of the game (and which can be exchanged in later game situations) demand a certain evolution progress to give benefits to their owners. 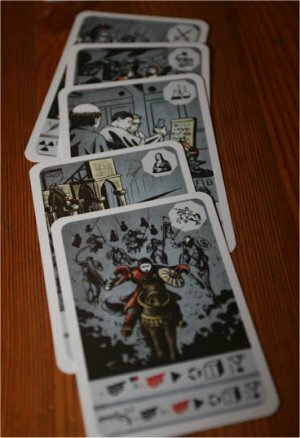 A turn of Historia is quite simple: At the beginning of the turn, all players secretly choose one or more (depending on their civilization progress) of their hand cards . All cards are then revealed simultaneously and - in turn order - carried out. Each card stands for an individual action and has two variants, the standard variant and - if you already have reached the corresponding civilization goal - an advanced variant that is stronger but often more expensive. The simple actions of military and technology let you move forward your development marker on the matrix as described before. These actions of course belong to the most important ones, and this is also be an explanation why new players often feel limited in their actions during the first few turns. The reason for this is that at the beginning of the game you need some steps on the development matrix to expand your opportunities, and so most new players only use these two actions in their first turns. But there are other actions you also can use at the beginning of the game. An interesting one and also a quite simple one is the art action. The corresponding card lets you take one (standard) or two (advanced) of the available wonder cards from an outlay that has been prepared at the beginning of the game and is replenished from time to time. There are a lot of different wonder cards with different effects. Most of them grant the player a bonus if a special condition is met. For example it could give you a victory point whenever you choose the military action card. But once a wonder card is activated, it is rotated and cannot be used until it is recovered during the end of turn phase. In addition to these simple actions, there are the more complex ones. For example, you can trade with other civilizations (which gains you an additional technology level under certain circumstances), expand your civilization on a map (I will come back to this detail a bit later), raid your neighbors (getting power cubes and victory points) and declare war to them (victory points). A lot of the actions demand the use of power cubes. As we are only equipped with four of these cubes at the beginning of the game, you must carefully choose which action you really need at the precise moment. However, used cubes are not lost, but are put to a used cube pool on the map. So you can use the exploit action card to recover power cubes from this pool again. And with progressing time players will also get new power cubes to use. The only situation in which power cubes are no longer available for a player for his actions is when he is expanding his nation on the map. This brings us to the last section on the board, the world map which can be found in the right bottom. Similar to Risk, we can see a segmented map of the world where we can expand our nation. The last four actions I have mentioned correlate to this map which is used for determining who is your nation's neighbor. Only countries next to yours can be raided, traded with or fought against. Expanding your civilization on the other hand lets you place one of your power cubes into a country adjacent to one of your already occupied countries. The mechanism of recovering used action cards is worth a closer look: once an action card is played and carried out, it is placed face up in a discard queue in front of the player. As long as it is lying there it cannot be used any more, but with the help of action cards and by some wonders it is possible to get cards back to your hand. However, it can take you a long time to get back the cards you have just played, and so hand management is an important thing to win the game. First of all there is a government bonus for the civilization goals we already have reached. Then there is a territory bonus. For this each territory on the map got a randomly drawn token at the beginning of the game. In the scoring, a player gets as many victory points as is indicated on the marker as long as he has one of his power cubes in this territory. Finally, there is the leader bonus, if the civilization meets the conditions of his current leader. Historia consists of the three Eras and each of this Eras has four turns with individual turn end actions. I must confess that even for me all those different actions and the abstract game design were a little bit confusing in my first game. But I soon got used to it, because every card and result gets along with clear symbols without an explaining text. Once I understood the different symbols (a reference sheet helps you with that) I had no problem choosing my cards. Quite typical for GIOCHIX.IT, there is a lot to be considered when choosing your different actions, and as indicated earlier playing depth is considerable beside the seemingly restricted number of different actions. 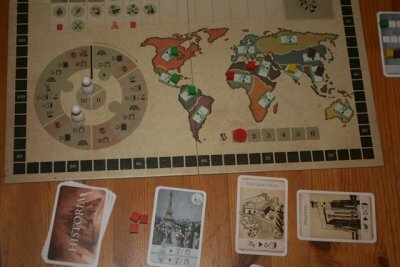 So, I think that the game is definitely not suited for the typical casual gamer, and in addition gamers who are looking for a simple game of civilization and players who need to expand their civilization visibly (in having more cards, more power, bigger countries etc.) might be disappointed. Sure, we have the map, but it is very small on the board and it only is used to determine your neighboring nations. Well at least that was my initial thought, but that is not quite correct since constant expansion on the map is extremely important for the scoring. 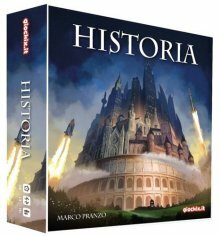 To my mind Historia offers a rather interesting strategic challange, once you have overcome the first two or three turns. I have no problems with the abstract design and the concentration on the development of your nation. Another point why I like the game is the excellent solo variant. Other than in Nations and a lot of other games, it is a tough challenge to win against the game. For the solo variant Historia uses "civbot" civilizations that develop and expand their nations by drawing from seven civbot cards every round. Up to five civbots are possible. A clever feature is that each of the civbots can have a different difficulty level, determining how many cards they draw in a round. Also, it is quite interesting that they also can fight against each other on the map and even elimination of other civbots is possible and likely in most games. I had some very exciting games with civbots and up to now I did not overcome the medium difficulty level. Here in Historia the civbots feel like real opponents, while in most other games with solo variants (like Mage Knight), only the length of a turn is determined by the game. Last but not least civbots can also be taken into game if you play with two or more players, making the game more challenging and interesting.